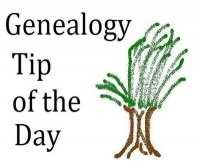 Genealogy Tip of the Day: Do You Look For Context? Do You Look For Context? No event happens in a vacuum. For years, I knew my great-grandparents move from the church to a half mile away to one six miles away was due to the them wanting their children to learn English. When I reviewed the christening places of their children, I realized that my great-grandparents probably waited to leave the nearby church until his father had died. Do you always try and put events into the life chronologies of your ancestor's relatives? Do You Look for a Deed After the Widow Dies? Was It the Start or the Finish? Do You Read All Those Estate Receipts? Did Grandma Translate Those Names? Manual Searches of Indexed Records? What Records Could Answer That Question? Is That First Letter Optional?